Romeo y Julieta's ROMEO San Andrés cigars feature a dark and earthy Mexican San Andrés wrapper, which is a first for the iconic brand and considered to be one of the most flavorful leaves on the market today. Altadis USA's Rafael Nodal and A.J. Fernandez were experimenting with different tobaccos to develop a blend with complex flavors, aroma, and exceptional balance. 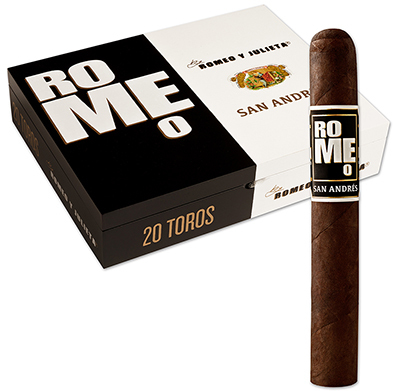 The delicious result is the ROMEO San Andrés line of cigars. Handmade at Tabacalera AJ Fernandez Cigars de Nicaragua S.A. with Nicaraguan and Dominican long-fillers, a Nicaraguan binder, and wrapped in the meticulously aged San Andrés leaf for which these premium cigars are named, ROMEO San Andrés cigars are lush, medium to full-bodied, and offer a sophisticated flavor profile that includes notes of dark chocolate, espresso, black pepper, nuts, and hints of dried fruit. You'll see this storied brand in an entirely new light after enjoying a ROMEO San Andrés cigar.